What happens, when animals who spent their whole lives in a ZOO escape the cages and enter the wilderness? A catastrophe! They know nothing about the world outside the ZOO walls, they have no instincts for survival. They are clumsy and simple minded and all they ever think of is tuna fish. Luckily, they have you to lead them safely through all the dangers in order to reach their homeland in Antarctica. 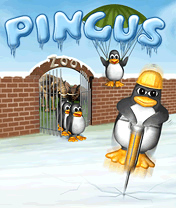 Pingus is an unique casual puzzle game for all ages and genders.